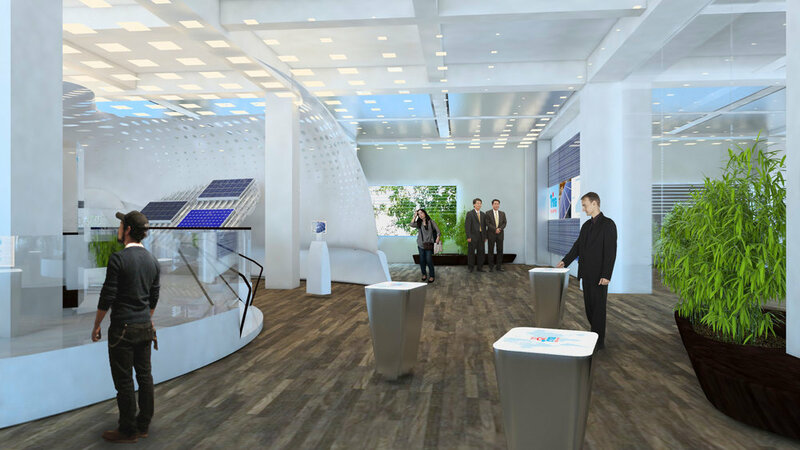 The Trina Solar showroom is designed as an immersive environment, creating a positive sensory experience with poetic, natural and tactile materials. Its goal is to educate and impress visitors of Trina Solar products and tie together brand goals. Through its delicate spatial arrangement, the showroom harnesses the power of the sun through reflective and refractive materials, which interact through varying scales and transparencies. The space orchestrates a variety of products together with oversized manufacturing equipment to bring the user one step closer in the journey of solar panel production. Its low energy strategy is achieved through high-efficiency LED custom lamps, natural surfaces, and exposed materials; this impact equates to an estimated energy reduction of 40% when compared with similar showrooms. Through the use of custom glass films, daylighting is redirected into the spatial interiors and controls the majority of lighting in the space. Through advanced technologies and interactive demos, visitors gain an impressive experience through ecologically-responsible means.